Instead of sharing a sketchnoting tip, I thought I’d write about a new habit that I’m working on forming: drawing my thoughts every day. It turns out that this is a great way to think about stuff and practice drawing at the same time. I find it difficult to draw a visual journal because I don’t think the everyday details of my life are all that interesting. On the other hand, I really like the way drawing helps me think through stuff. Instead of drawing what I had for lunch, then, I pick an idea or question I want to explore, and then I start writing. Sometimes I’ll add little sketchnote-y doodles. Sometimes the page is full of text. I always end up learning a little more or having a clearer understanding, so it all works out. The sketchnotes are more fun to create and easier to share than writing text notes or making simple mindmaps. They’re also easier to review. 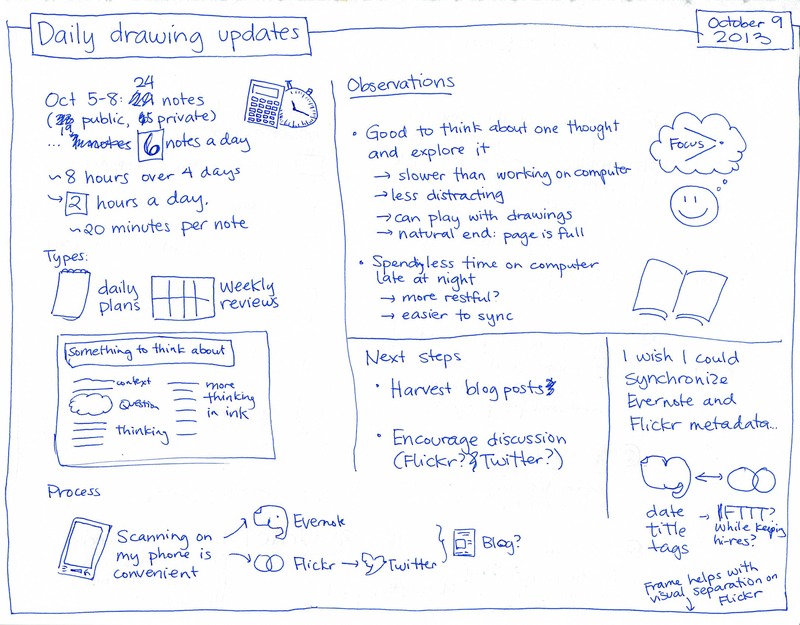 I scan my sketchnotes every day and import them into Evernote and Flickr, and I’ve flipped through my digital copies a few times already. I fill way more pages when I use drawing as a tool for thinking instead of just as a tool for recording other people’s thoughts. I’ve been averaging 6 notes a day at about 20 minutes a note, and I consider it time well spent. As I get the hang of doing this, maybe my notes will be more creative and more elaborate. We’ll see! What do I want to learn about learning? Where are my people gaps? What’s getting in my way when it comes to delegation? How can I help people save time? I’ve also been drawing my daily plans (08-Oct-13, 07-Oct-13, 06-Oct-13) and weekly reviews. 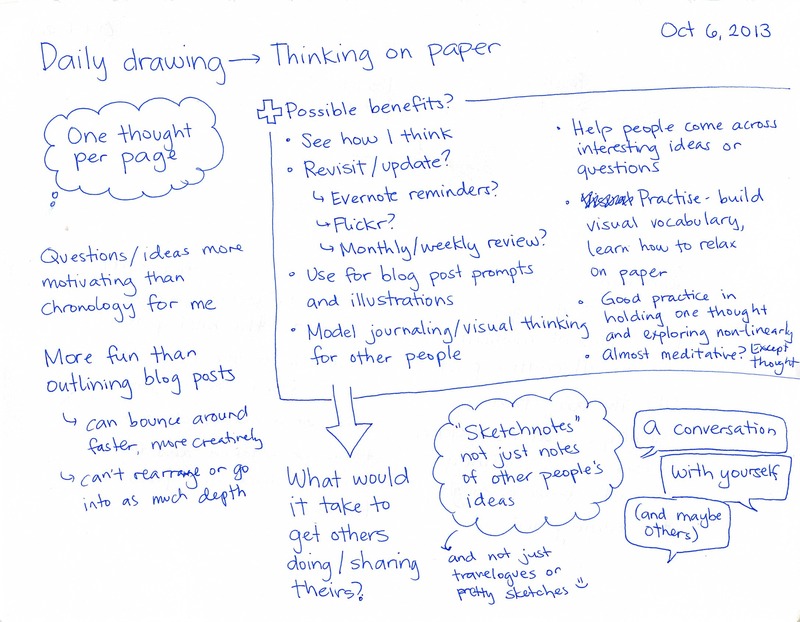 Do you sketch your thoughts? Try making it a daily habit!